As entrepreneurs and independent business owners, sometimes we get so focused on business and hustle that we forget about heart. We forget about the importance of people and the empathy and understanding that go into building relationships overall, but especially within the context of building business. I'm excited that Claude Silver, Chief Heart Officer of VaynerMedia (a Gary Vaynerchuk company) will share her insights on people, teams, heart and hustle at the Seth Godin Mastermind at the Smart Hustle Small Business Conference. 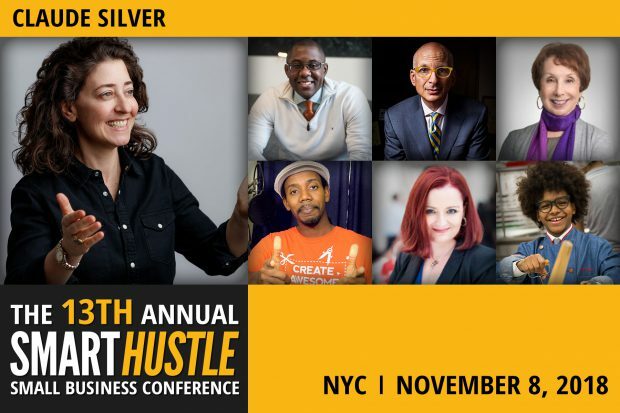 The Seth Godin Mastermind taking place at the 13th Annual Smart Hustle Small Business Conference is held in New York City on Thursday, 8 November 2018. Hosted and produced by Ramon Ray www.ramonray.com , entrepreneur, global speaker and best selling author, the Smart Hustle Small Business Conference is one of the best events for business owners hungry to grow their business and better themselves! Attendee, after attendee, after attendee share how much fun they had, information delivered, and tips and insights they received from the main stage. For the past 13th years, Ramon has brought together hundreds of entrepreneurs and business owners who spend a day learning from main stage speakers and networking with each other. One of the major highlights of the conference is the in demand “Seth Godin Mastermind” a 90 minute, intimate, discussion with marketing master and thought leader Seth Godin. Seth takes the time to share his thoughts on marketing, branding and more and more importantly answer specific questions from the attendees. The conference, an all day event, is an exciting time of networking, inspiration and practical ideas to grow and scale one’s business.